In addition, due to a recent pricing transparency update made by The Centers for Medicare and Medicaid Services (CMS), hospitals will soon be required to publish their charges online. These updates are the first step in a long-term effort to give patients more control over their healthcare by providing an online platform where patients can get all the medical information they need in one place. More CMS requirements will come over time, but there are steps you can take now to meet the changing demands of your patients. This process can take some time to fully develop so it’s beneficial to create a strategic plan for how and when you will be able to provide patients with accurate online estimates before your competition develops theirs. Below, you’ll find two examples of the different ways hospitals can provide online estimates to their patients. These examples can help generate some initial ideas for how your hospital will design its online platform, although, ultimately it is up to your hospital to determine the best way to engage with your patients. In this first example, we’ll walk through how MetroHealth, a hospital in Cleveland, OH provides online estimates to their patients. 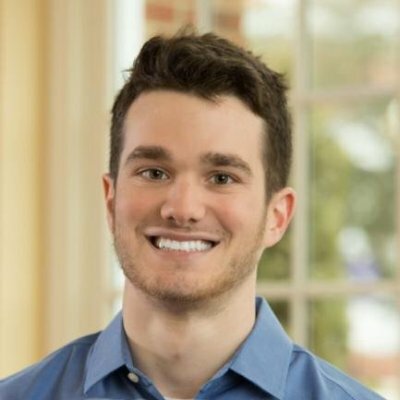 We will analyze each page of the process to discuss the benefits of how they positioned their content and design choices as well as how providers can help patients to input accurate patient information in order to provide an accurate cost estimate. 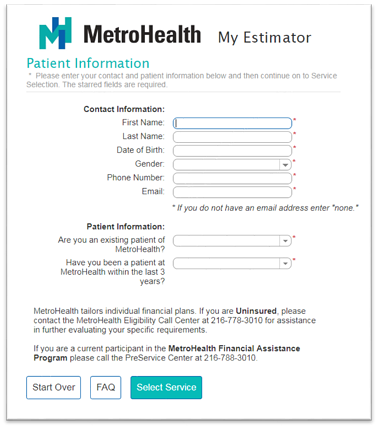 At MetroHealth, this is the first page patients will see when requesting an online estimate. Here, the patient is asked to fill out their basic contact information as well as information regarding any previous services they may have had at MetroHealth. This should not take more than a few minutes to complete. Once they have filled out the form, they will click Select Service to proceed with the estimate. MetroHealth offers an intutive point and click body diagram to allow patients to interactively select service by body part. A: Patients can begin by clicking on the part of the body they want to schedule a service for. To do this, they simply hover over the body and select the appropriate area. This will automatically populate the 3 menus below, but does not prevent the patient from making any necessary changes. B: If necessary, patients may use the service category menu to identify their specific area of concern. D: If necessary, patients may use this menu to identify how they plan to pay for their medical service. E: If the patient needs further assistance, they may click Need Help to speak to a customer service representative for any questions or concerns they may have about their online estimate. F: Finally, once the patient has made sure the information they’ve selected is correct, they can click Get Estimate to receive their accurate online price estimate. This is the final page the patient sees before receiving their full online estimate. 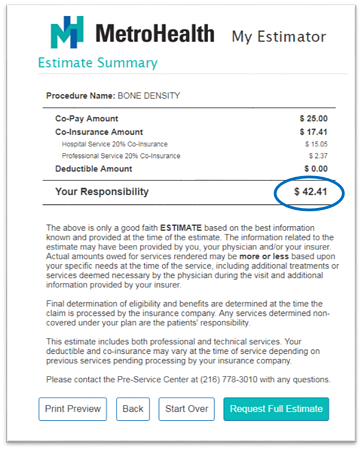 Using the information provided in the previous pages, the estimator tool then creates a summary of the patient’s financial responsibilities, including items such as their co-pay, co-insurance, and deductible amount. Another important factor is they chose to break out the different costs for the hospital (technical) and physicians (professional), giving the patient a more detailed and complete estimate. This form also provides a disclaimer to inform the patient that the estimate provided serves as a good faith estimate and the actual amount of the services may be more or less based upon their specific needs at the time of service. Once the patient had read the disclaimer, they can request a full estimate, print out a hard copy of the Estimate Summary to keep for their personal records, or start the process over again if they wish. 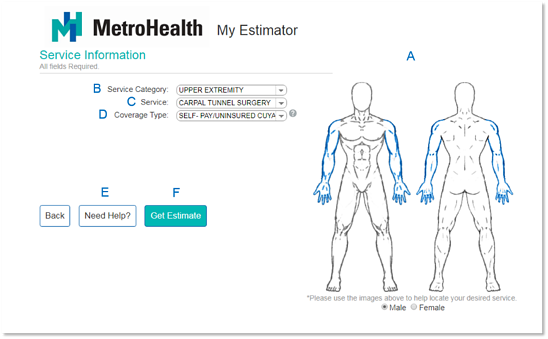 To see MetroHealth’s My Estimator live, visit their website. 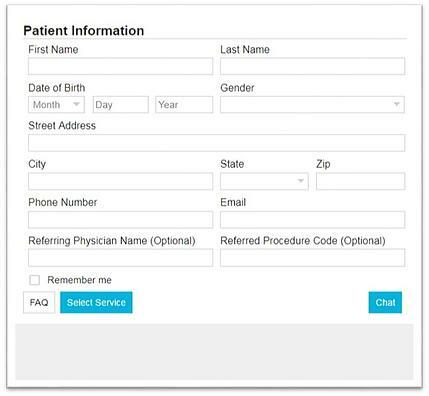 To begin the process, patients will be asked to fill out this basic patient contact form. At the bottom of this form, patients can choose to view frequently asked questions, select the medical service they need, or chat with an online customer service representative who can assist them with any questions or concerns the patient may have. Also, it’s a best practice to include a “Remember Me” check box for the patient’s convenience so they don’t have to re-enter their information later. Here, the patient will be asked to provide basic health insurance information as well as the type of medical service they require. To begin, the patient is asked whether or not they have insurance, which will determine what additional information the patient needs to provide. This basic insurance information can be found on most health insurance ID cards without having to go through much effort to locate this information. In the second section, patients are asked to identify the area of service they require. If the patient chooses to compare the cost to other healthcare providers, they can click on Facility Selection to view a list of other nearby hospitals offering the same service. 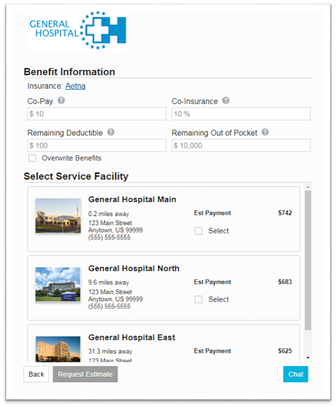 After clicking on Facility Selection, patients are taken to the final page where they can input their insurance information and even compare prices against other hospitals. In the top section, consumers can input their benefit information which is used to calculate the price estimate and deliver a list of other service facilities whom offer the same service, providing consumers with the power to compare prices among multiple providers at one time. As you can see from the image above, this list includes any information the consumer needs to make their decision such as the name of the provider, driving distance between themselves and the provider, and of course, a price estimate for the procedure. This is a key differentiation for this healthcare system: They give their patients pricing options based on location. A more cost-conscious patient might choose to go to a hospital a little further in order to save some money. This offering should be a key consideration for healthcare systems with multiple facilities. 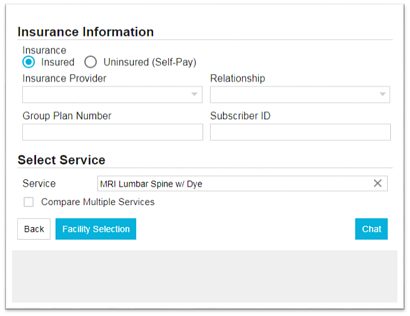 Finally, at the bottom of the page is where patients can click to request a formal estimate or chat with a trained customer service representative for questions or concerns regarding their price estimate. Providing accurate online estimates is crucial to the success of your organization because it conveys to the consumers that the hospital is trustworthy. However, it is not enough for hospitals to simply place price estimates available via an online platform; they must be presented in a clear and engaging format where the patient is prompted to read through each step carefully before receive their full estimate. With so many questions looming when it comes to patients understanding their financial responsibility, establishing credibility with the patient is the key to growing revenue and maintaining a competitive advantage in your market. To learn more about the latest in price transparency strategies, check out our latest on-demand webinar Price Transparency and Consumerism: Best Practices for Online Patient Price Shopping.